As winter tightens its grip around the Northern Hemisphere plunging temperatures have been blamed for dozens of deaths in Europe with a cold front moving in. The plunging temperatures have affected countries as far south as Greece Spain and Turkey causing chaos to the unprepared Mediterranean countries. The UK is bracing itself for the next big storm coming in from the Atlantic which will bring with it dangerous winds high seas, and from Friday we could see snow in many places, showers are more likely to be snow than rain. 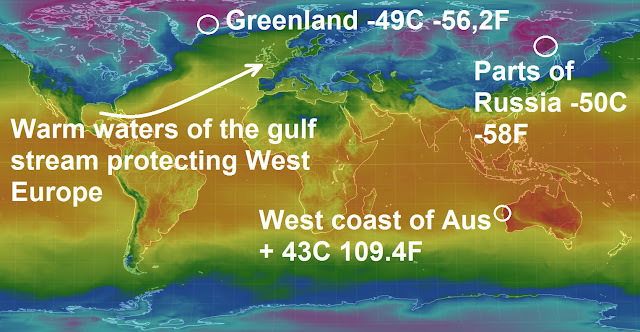 Meanwhile as winter takes hold in the North with parts of Russia and Greenland hitting minus 50C the high summer has hit Australia with temperatures well above 40C on the West coast, see chart above. In the US Temperatures will continue to plunge to dangerously low and damaging levels into Monday in the wake of the snowstorm over the southern United States. Those without power in the wake of the winter storm could face additional hardship due to the severe cold. The extremely low temperatures will increase the risk of frozen pipes. Despite sunshine, travel will remain slick and hazardous on untreated roads and sidewalks in the Carolinas. Snow and ice will be slow to melt into Monday due to persistent subfreezing temperatures. "Periods of rain and mountain snow will follow on Monday, especially in north-western California and the Sierra, before the next heavier round slams into northern and central California Tuesday into Tuesday night," AccuWeather Senior Meteorologist Kristina Pydynowski said. How much of this weather is done through HAARP for weather wars? I want my carbon tax back, with interest, and compensation for the fraudulent claim.